Step 1: Mix the cake according to the box directions or prepare your recipe however you like. Grease the bundt pans and pour equal parts into each pan. Bake according to your recipe directions. Step 2: Allow the cakes to cool. Let them cool about 20 minutes in the pan, then an additional hour or so on a cooling rack. Step 3: Place one cake upside down on the plate. Use a serrated knife to cut the top of the cake to make it level. Repeat with the other cake. Step 4: Mix the frosting with orange food coloring to create an orange-colored frosting. Spread some on the cut side of one cake. Step 5: Sandwich the two cakes together, creating a rounded, pumpkin shape. Align the ridges of both cakes to match the pattern. 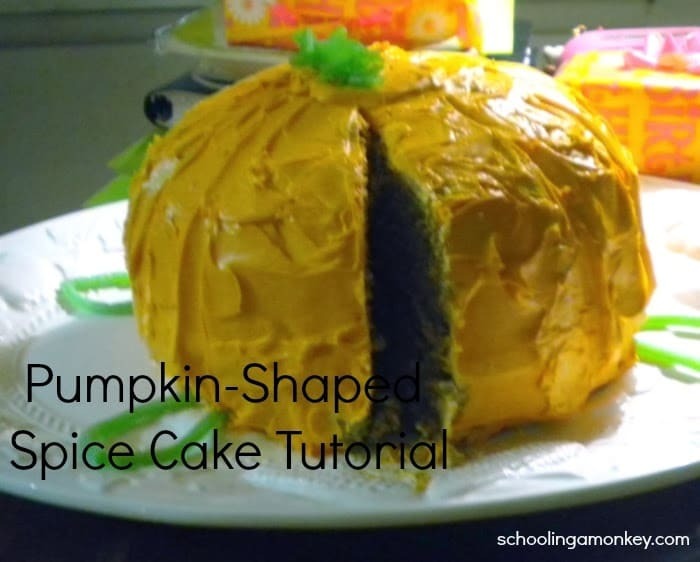 Place a small cup in the hole of the cake to make it look more like a pumpkin and less like a giant donut. Put the cake onto your cake plate. Step 6: Frost the cakes and hide the seam. Cover the cup in frosting as well. Pipe green frosting on the center of the cake to look like a stem. Have you tried to make a pumpkin-shaped cake before? What method did you use? Linked up with Mommy Club Link Up.